My husband and I are native Idahoans and high school sweethearts. The Grove was the first place we saw each other on our wedding day. This photo was taken moments after our first look. We are so excited to have the opportunity to purchase a brick to be placed in this nostalgic location to honor our journey. We moved to Idaho in 2002 from Florida, 2 weeks after my husband and I got married. We only meant to spend a year there, exploring the West. Instead, we spent 12 years in the beautiful state. We both graduated from Boise State University and had 3 beautiful children and worked at St. Luke`s. However just a few months ago we relocated to North Carolina to be closer to family. We miss Idaho deeply. Since leaving we have learned a lot.... the biggest thing we learned is that we are Westerners now, no... Idahoans at heart! 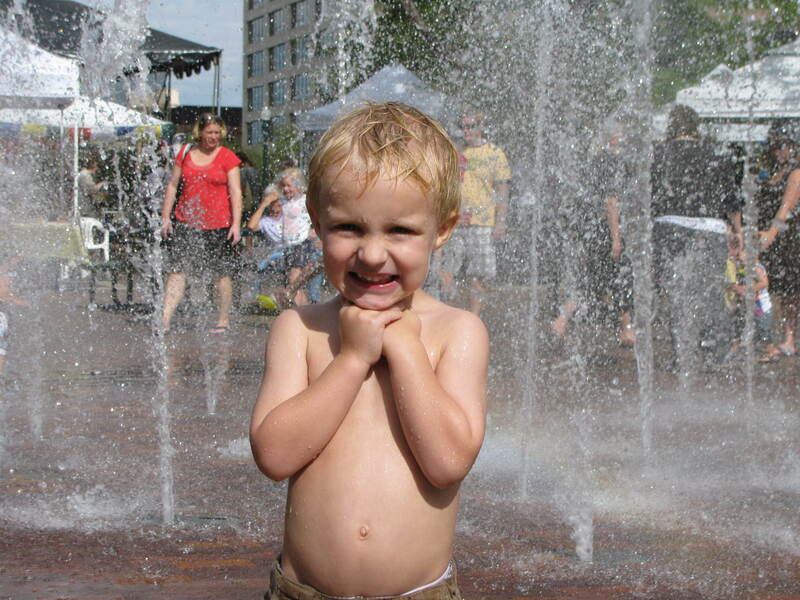 This picture was taken of my oldest child Ian in 2009. This photo was taken of my husband I the morning after our wedding day, 8/26/2012. We are celebrating by running through the fountain. We have so many great memories here which is why this is the perfect place to honor our two little girls with their very own brick. We look forward to running through the fountain with them on our trips to go find their brick. My parents bought a brick for me (Krista Perry) and my twin sister, Carol, in 1986 when we were only a few years old. I always loved that we had a brick with our names on it. The Grove is such a unique place in the heart of Boise and it felt special to be a part of that. In May, I gave birth to twin boys and my wife and I are ecstatic to be able to have them recognized with a brick. We love Boise and are so excited to be able to share a part of the next chapter in the city`s growth with them. From the past to the future, this is such a great tradition! I did this because I wanted my daughter to be a part of history. She can share this with her family one day and on to the future families. I also wanted her to have a place in the world where she will always be remembered. I never imagined how much I’d fall in love with this city – the vibe, the people, the culture… Boise is a part of us. Of our story, of who we are as individuals, husband and wife – and now as a family. We love this city and can’t imagine raising our family anywhere else. We’ll always hold a special place in our heart for the Grove Plaza. It’s where our journey began.